"This is NYC on Madison Ave"
Subject: This is NYC On Madison Ave. This is an accurate picture of every Friday afternoon in several locations throughout NYC where there are mosques with a large number of Muslims that cannot fit into the mosque - They fill the surrounding streets, facing east for a couple of hours between about 2 & 4 p.m. - Besides this one at 42nd St & Madison Ave, there is another, even larger group, at 94th St & 3rd Ave, etc., etc. Is there a message here???? 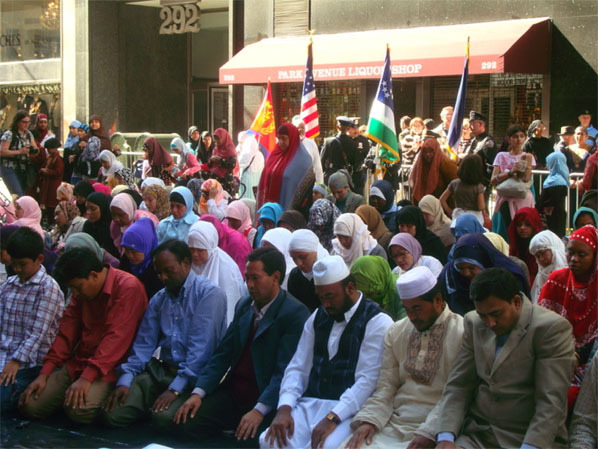 Yes, there is, and they are claiming America for allah. if we don't wake up soon, we are going to "politically correct" ourselves right out of our own country! Hey, thanks for sending this. 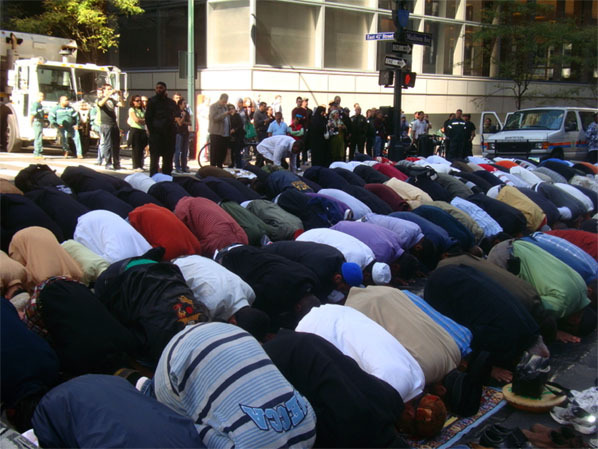 I looked into this a bit and this is not, as the e-mail suggests, a case of Muslims stopping "normal traffic every Friday afternoon by worshiping in the streets." As you can see, this seems to be an organized and planned event. The presence of police officers and guard rails should give that away. 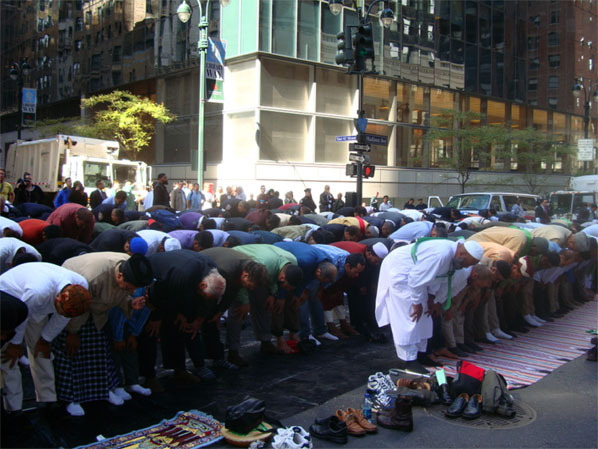 For about 25 years now, a group has organized an annual Muslim Day Parade in New York City. You'll note that when this event was first held, President Ronald Reagan was in the White House. Somehow connecting this to President Barack Obama is silly. Every year, the organizers get the proper permits and like any other group, are free to march, pray, have concessions, what have you. These pictures appear to be from the 2009 event, which was held last October 18th. The e-mail explicitly states that these pictures were taken on a Friday. Many people would uncritically believe this because Muslims around the world hold large weekly congregational prayers on Friday afternoons. This event, however, occurred on a Sunday. And it wasn't ad hoc. It was actually listed in the New York Times events section several days before it took place. I hope this clarifies some of the confusion. If something seems out of the ordinary, it's always good to do some research.